Remember the other week I wrote about trekking all over Rome to find a pizzeria late at night? The same thing happened the next evening, too, when we yomped across the city to a closed-down restaurant, complete with tumbleweed rolling past the door. Luckily, I’d idly canvassed some twitter opinion on decent restaurants when I was still within range of the hotel’s wi-fi and the collective, crowd-sourced wisdom of the masses threw out a name that kept being repeated. “Best pizza in Rome”, they tweeted,” authentic”, “far enough away from the tourist trail to make it the real deal”. So, a quick look at the map and a happy dawning realisation that it was just over the Tiber in Testaccio and off we set for Pizzeria da Remo. It’s a bit of a tired cliché, but local people in a restaurant is normally a good sign, and da Remo was packed with Italians…couples, families, big groups of friends, all with seemingly enormous appetites. I know that Italians generally think that a proper meal consists of at least five courses, but the amount of food the tables around us seemed to be eating was mammoth. And what food it was. da Remo’s pizza is rightly touted as some of the best in the city, and by a natural consequence according to most Romans, the whole of Italy. It’s a splendid thing to see…rolled flat and thin to the edges, the crust charred but not burnt, striking that fine balance between bread and the bitter charcoal aftertaste of proper wood-fired food perfectly, spare toppings, rich tomato sauce, top-quality mozzarella. A wonderful thing to see and an even better thing to taste. 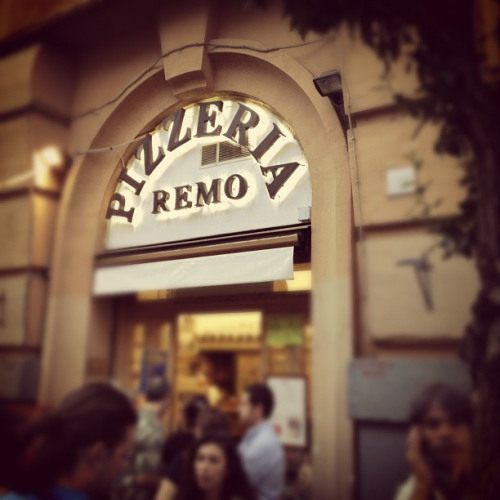 da Remo’s buzzes with life, tables spilling out onto the pavement through large open doors, Romans sat happily eating dinner as people mill around waiting for tables to come free. It has the feel of a local favourite, a place that’s loved by its customers, where the slightly brusque waiters know their food is some of the best there is, where their brusqueness melts at the sight of a five year-old blonde-haired English girl, returning in an instant on receiving a rollicking from The Boss for fussing over her ice cream, shrugging it all off with Latin flair. Bellissima, she was told repeatedly all week, just like da Remo’s pizza. I believe I went to this very place when I was in Rome. It was a long time ago but I had an instant memory snapshot as soon as I saw your picture of the entrance. I had the most exquisitely cheesy and spicy pizza bianco there. It has remained unmatched my any pizza – bianco or otherwise – since. At the time we went, my siblings and I were fairly young. I was probably not much older than thirteen. My sister inherited the Dutchness in our family and was/is radiantly blonde whilst I look a lot more Jewish and I was so JEALOUS that she got so much attention because of her stupid blonde hair! She says she was jealous that I got to finish all my gelatos in peace. I am ecstatic that I was able to read your blog before making my trip to Rome next month. Event though you do not have a picture posted of the actual food (I wish there was) your description is duly making my gob water. I am excited for my trip. Cheers for the post!